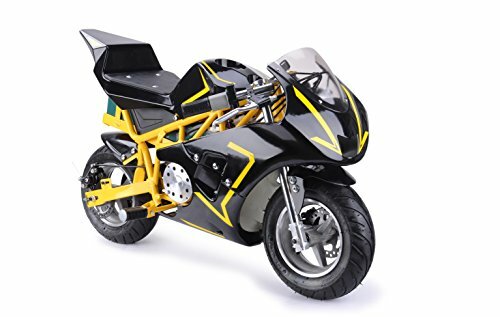 The first wave of pocket bikes came fast. These miniature gas-powered motorbikes were supplied by stylish Italian manufacturers, costing upwards of $3,000. The arrival of imitation imports fueled the craze further by offering the same thrills for around $200. But, it’s the third generation of pocket bikes that’s legitimizing the industry. 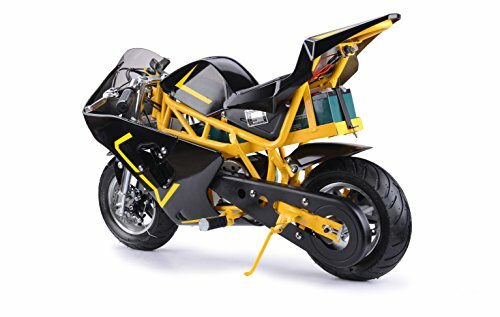 The electric pocket bike, unlike their petrol-fired counterparts, don’t carry riders at 50mph 20″ off the floor. Nor do they sound like a fleet of angry hornets buzzing around the local lot. 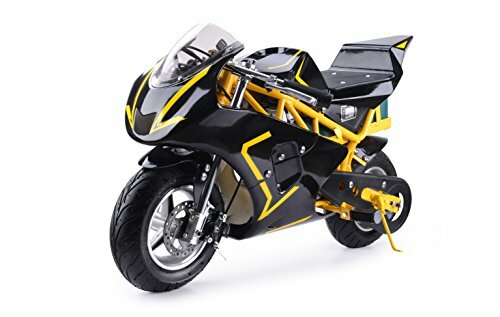 These zero-emission training bikes are suitable for children, surprisingly quiet and represent the safest introduction to real moto-racing on the market. Today, we’re looking at the latest offering from Moto-tec. 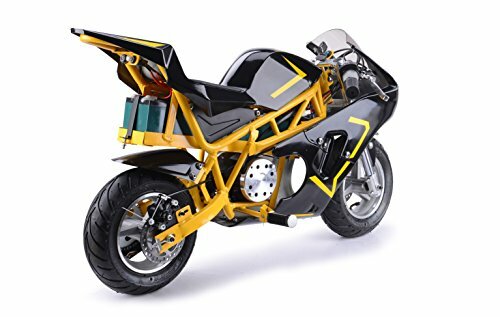 A 36V, 500W pocket bike with a mean look and an affordable price tag. From top to bottom the Mototec GP looks a performance bike. The chrome finish combined with slick yellow racing lightning bolts (which are also available in red and blue) is sure to get young pulses racing. There’s also a sturdy looking support frame and a wind visor for high speed cruising. 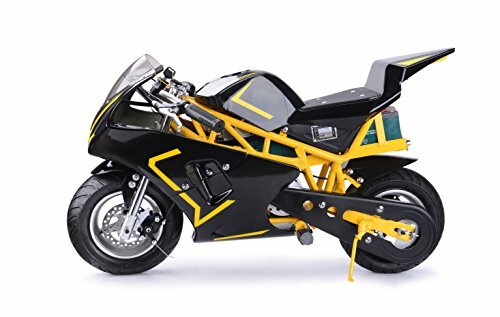 The only difference between looking at this and a fully fledged sports bike is the size. Standing at 23″ it’s a few inches higher than it’s younger brother the Mototec-Cali. It also supports heavier riders of up to 170llbs. Under the hood, the GP is very much the same as the Cali. There’s a 36V charge which comes courtesy of three 12V lithium cells. The 500W engine is capable of taking you up to 20mph which, at 18″ off the tarmac, will feel a lot closer to 50. The variable twist throttle is quick to engage the engine power at full tilt, but can be held in place for slow starts whilst you’re getting used to it. This isn’t a pull start so there’s some leeway for beginners to get used to the speed and power on offer. The ride is comfortable enough. The single padded saddle is about 18″ off the ground whilst the handlebars are adjustable for taller riders. Large treaded tires help to provide grip although, leaning into corners takes some getting used to. In smaller spaces, you might have a bit of trouble as the turning circle is broad. When your buying your kids any type of bike the brakes are going to be the most important thing to look out for. The Mototec GP uses dual disc-brakes for the front and rear tires. There’s not really enough speed to worry about the brakes locking whilst the stopping distances on hills was very impressive. Keeping control, as well as putting down power, is all about the tires. Pneumatic, 11″ tires with racing grip are fitted to the front and rear of this bike. Refilling them is relatively easy, although we’d recommend using a pressure pump rather than a hand pump due to the width. It’s a pretty simple setup on the tech front. The ignition is key operated and you get a battery meter just below the windshield. There’s no Bluetooth connectivity, or app design which we felt would be popular with a younger market. It’s not simple, but its not impossible either. The bike comes in a decent shape with just the stands, handle-bars and seat to be attached. Some customers had to make extra adjustments to get the most out of this bike which is worth bearing in mind. You’ll need some skill, but you don’t have to be a mechanic. At cruise speed you’ll be getting about 50 minutes of riders time. The close you are to the 170llb weight limit the more likely you are to drain the battery faster. Equally, tackling hills, trails or riding flat out will give you closer to a 30 minute range. You’ll be waiting 4-6 hours between charges so use your range wisely. No-one wants to push a 27″ bike all the way home. Under $500 dollars is a decent price to pay for a bike of this quality. The steel cage adds durability whilst the engine is powerful enough to be a lot of fun. There’s not too much difference between the Mototec GP and the Cali in terms of price. In fact, the only difference we can see is the higher profile and weight limit. There's not too much to choose from between the GP and the Cali. Although, of the two, the GP is more expensive. The higher profile seating alongside adjustable handlebars is what sets the GP apart. 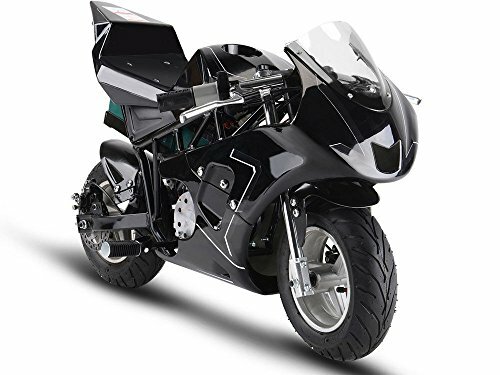 The sleek chrome finish is delightful to look at whilst the braking system and twist throttle are easy to get the hang of.The build is sturdy and well designed but the overall performance does limit its usage. An easy introduction to moto biking but probably not powerful enough to keep riders entertained for long.